Pricketts Fort, constructed in 1774, provided early settlers a place of refuge from Native American attacks. It was built at the confluence of Pricketts Creek and the Monongahela River, and was ten miles from three major American Indian trails. The fort, which covers a 110 by 110 foot square, was built by the community militia and was named after its captain, Jacob Prickett. 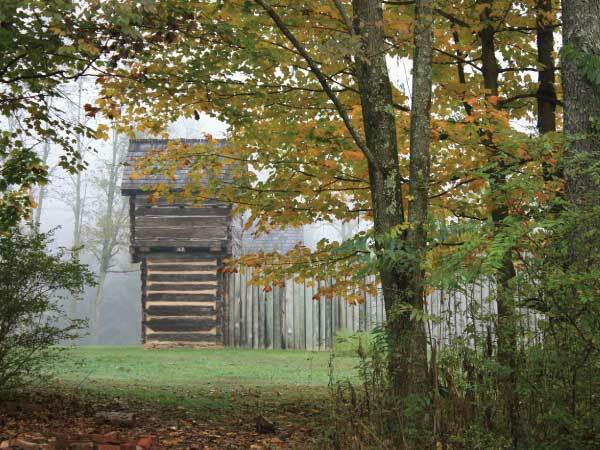 Two-story blockhouses are set at the four corners of the 12-foot high log walls, and were used by the fort’s defenders as lookouts. Lining the weathered stockade walls are 14 small cabins, some with earthen floors, which served as shelter for the women and children. A meeting house and storehouse fill the common area. There are two large gates: one double gate facing north, and one smaller gate facing west. When the threat of Native American uprisings occurred, up to 80 families from the surrounding countryside would gather at the fort. This was referred to as “forting up.” Families would stay as long as the threat existed; this could be a few days, to several weeks. Under cramped and primitive conditions, the settlers understood life in the fort to be a sacrifice for survival on the dangerous frontier. Today’s fort allows visitors a unique glimpse into that life and time.